In July 2010, the LT Board held a strategic planning session to define priority needs, which included a paid executive director for ensuring continuity and professionalism to move the organization forward. Led by Trish Reed, Terrie Arnold and Gene Erwin, LT initiated a sponsorship program to generate funds to pay an Executive Director; first year garners nine sponsoring partners, but "it's a growing list!" LT Board hired LT alum Ruth Ellen Whitt as first paid part-time Executive Director. Calendars, processes and policies are reviewed and formalized for internal integration and alignment. Monthly communication with LT grads began with monthly eNews blasts. Annual Meeting prior to Lunch with Leaders - April 2011 included a major bylaws revamp to reflect LT's mission focus on "Working Together For Community Excellence, Pride and Progress" and to enable the Board of Directors to better function. Members approved bylaws as well as increases in membership dues and in LT Class tuition and an increase in class size from 25 to 30 participants annually. 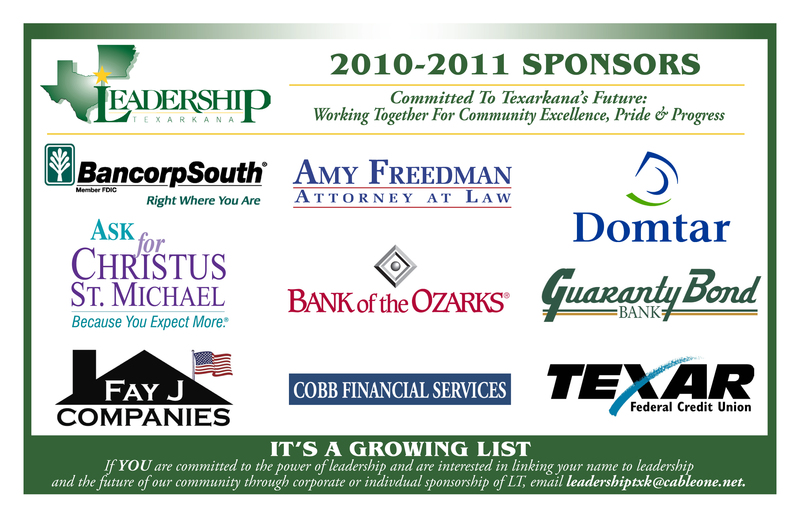 At Fall Membership gathering in October 2011, LT Board announced the launch of the Leadership Initiative for Texarkana (LIFT) to engage the community beyond the five hundred plus LT Graduates in Working Together for Community Excellence, Pride and Progress. At Annual Lunch with Leaders in April, LIFT launched community sign-ons, public presentations, and bi-weekly editorials in Texarkana Gazette to generate public expectation and interest in the offer of a LIFT-Hosted Joint City Leaders’ Summit, to bring together the elected officials and City Managers of the two Texarkanas. As part of LIFT, LT hosted the Joint City Leaders’ Summit, Jan 31-Feb 2, 2013, led by facilitators Mary Jo Clark and Pat Heiny from Contemporary Consulting - to bring together the elected officials and city managers, with Chamber leaders, to build trust, respect and understanding, as well as to foster a commitment to Working Together for Community Excellence going forward. May: LT launched a revamped website with new functional online resources for the community. May: LIFT hosted a Joint Summit on Beautification, bringing together representatives from community-wide organizations as natural partners in beautification, to compare notes, identify shared priorities, and best possible next steps for action. From that conversation, Keep Texarkana Beautiful developed a joint effort to work through students on beautification initiatives. April Lunch with Leaders: LT unveiled the LIFT Focus for the Future, inspired by input from facilitators at the Joint Summit, and encouraged by the City of Texarkana, TX City Manager; compiled input from decades of past visioning and goal-setting by community to identify the citizens’ vision and values repeated for decades. Guest speaker Bill Cork spoke on Creative Disruption at the community level. May: LT hosted Leadercast 2014, in partnership with Texarkana College for close to 300 community leaders. May: LT Board added additional opportunities for Sponsoring and Event Sponsorship in support of Leadership Texarkana Programs and events. June: City of Texarkana, TX passes a resolution embracing the LIFT Focus for the Future as a framework for goal-setting and reporting, aligning with citizen-expressed priorities. June: TYTL program profits from new goal of equal-sized groups for all participating districts, with eight from each of the city school districts, under the leadership of Tina Veal-Gooch and Robin Hickerson, in partnership with support from each of the four city districts. TYTL group selects individuals for a Mayors’ Council, but timing is not ideal to implement. February: LT hosted a follow-up Joint City Board/Council Meeting with newly elected officials and led again by Mary Jo Clark and Pat Heiny, to plan best structure and process for working together. The LIFT Team met with Pat and Mary Jo for reflection on LIFT’s role and opportunities to serve in the community. The LT Board voted to rename the Idalee Hawkins Award to the Idalee Leader of the Year Award, to clarify its status as for the Outstanding Leader, even as fewer people recognize the name Idalee. April: Annual Lunch with Leaders featured Mayors Ruth Bell and Bob Bruggeman reflections on the LIFT Summits and their work as mayors to benefit all citizens. The first annual LIFT Report to the Community was published, including a first LIFT CHALLENGE on beautification. May: LT contracted with MemberClicks to make next strategic step forward for the organization, through better technology. David Reavis led the effort to transition to the new platform. 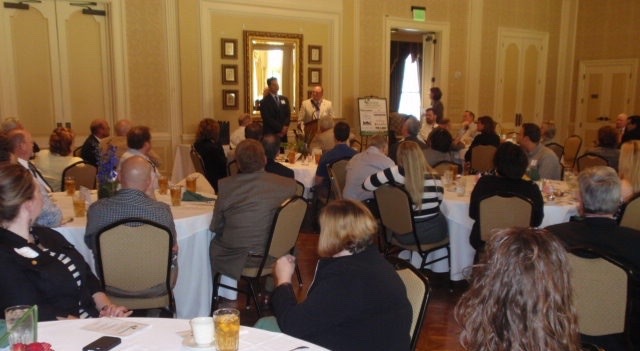 May: LT hosted Leadercast 2015, in partnership with Texarkana College and the Chamber of Commerce. June: LT established its first independent LT office at Hands On, with dedicated equipment and support staff. June: TYTL program profited from new opportunity of adding one group of students from districts in the area, which included DeKalb, Genoa and Trinity Christian School. TYTL group selected individuals for a Mayors’ Council again, with regional representatives, and with timing conducive to implementing. September: First meeting held for the LT LEADERSHIP TEAM comprised of one member from each of the LT Classes, along with five at-large members, to provide advisory preview and review to LT plans and programs, as well as to deepen the bench of LT grads whose wisdom and experience is being tapped for LT excellence. October: Inaugural Leadership Luau held for all members, partners, initiating a tradition of having the most recent class graduates take charge of and host the Fall Party for the organization. Sponsored by the City of Texarkana, TX. As follow-up to a LIFT motivated “What If” proposition, TAMU-T hosted a joint summit of organizations and entities involved in economic development for the region, with plans to reconvene in February. February: New MemberClicks based website goes live, enabling new levels of engagement with all community leaders and partners. The DAILY AND WEEKLY LIFT program is implemented to build pride in Texarkana.